The movie review portion of the following article was originally written for and first published on my personal 'Dune' movie merchandise web site. It is being reprinted here with permission (from myself). Because I have a very deep, personal connection to this movie, I reserve the right to retain the copyright to that text. The remaining technical portions of the article are new and exclusive to High-Def Digest. The HD DVD release of 'Dune' was previously reviewed by High-Def Digest upon its release in 2006. What is it about certain movies that can drive a person to obsession? When David Lynch's film adaptation of 'Dune' premiered back in 1984, it was released to almost universal scorn. Fans of the Frank Herbert novel upon which it was based despised it for daring to leave out a couple paragraphs of the author's verbose prose and changing a detail or two. (Oh no, the desert warriors now fight with guns rather than kung-fu – the heresy!) General moviegoers lured to the multiplex by ads that promoted it as the next 'Star Wars' couldn't make heads or tails of its complicated story, were bored by its lack of major action scenes, and had no idea how to interpret the filmmaker's stranger affectations. Roger Ebert declared it the worst movie of the year. Budgeted at over $40 million, it was one of the most expensive science fiction productions made up to that point. (For reference, the prior year's 'Return of the Jedi' cost only $32 million.) And it was a tremendous box office bomb. For years afterward, any mention of 'Dune' would invariably be in the context of biggest movie flops, categorized with the likes of 'Cleopatra' and 'Heaven's Gate'. Even to this day, the film is still considered by most movie-watchers a baffling failure. Its director has completely disowned it. None of that matters a bit. I love 'Dune'. No, I adore 'Dune'. I've watched it dozens upon dozens of times, in 35mm and on every home video format that has ever existed. I know the film on a practically frame-by-frame basis. I can recite major portions of the dialogue verbatim. I've amassed a sizable collection of memorabilia and merchandise related to it. Of the thousands of movies I've watched in my life, I would never be foolish enough to call 'Dune' the best film I've ever seen, but it is my favorite. I have no shame about that, no matter how few people will ever understand it. The way some people are fixated on 'Star Wars' or 'Star Trek', I am utterly, rapturously, obsessed with 'Dune'. And the movie continues to reward me. The circumstances by which an eccentric cult filmmaker like David Lynch could ever be put in charge of a major science fiction production still seem impossibly unlikely. With only two features on his resumé at that time – the bizarro midnight-circuit oddity 'Eraserhead' and the stately black & white historical drama 'The Elephant Man' – the director found himself courted by no less than George Lucas to direct the then-titled 'Revenge of the Jedi'. Lynch turned that offer down because he didn't want to work on a sequel to someone else's original material. (I suspect he wasn't too keen on all the teddy bears either.) Finding him available, Dino De Laurentiis promptly scooped Lynch up for 'Dune', a book that had already been through several failed attempts at adaptation by the likes of Alejandro Jodorowsky and Ridley Scott. Lynch had never even heard of the novel at the time, but promptly devoured it and found many opportunities to bring his own vision to the universe Herbert had created. He accepted the challenge. After a grueling four-year production, the resulting film is certainly one of the strangest big-budget extravaganzas ever made. I'll be the first to admit that narrative coherency is not the picture's strongpoint. The Frank Herbert novel was quite long and very densely plotted, an epic tale of politics, religion, war, science, philosophy, environmentalism, and adventure. The movie attempts to cram all those elements into a 2 hr. 17 min. length and winds up greatly condensing many of the storylines. It drops the audience into the middle of Hebert's complex universe with insufficient introduction and little attempt to explain the reams of confusing alien terminology. Even the book needed a glossary to help readers navigate the likes of Mentats, Bene Gesserits, Gom Jabbars, ornithopters, crysknives, and the Kwizatz Haderach. The movie has no such handy reference that viewers can refer to. When the Fremen leader tells our hero to, "Take this Kiswa Maker Hook of our sietch," almost none of those words have been defined in proper context for the audience to understand. As if that weren't perplexing enough, characters often go by multiple names: the lead Paul Atreides is known as either Usul or Muad'Dib at different points in the story, for reasons not sufficiently spelled out here. If you aren't already familiar with the book, it's easy to get hopelessly lost. Some storylines are so compressed that the movie has to bridge them with frustrating and clunky voiceover narration. The major romantic subplot is covered in its entirety by the single line, "Paul and Chani's love grew," as if that were all we'd need to know about why these two characters who just met are all of a sudden acting like they're married. And there's no avoiding the fact that the entire last act of the movie falls completely apart, from its indifferently-directed huge battle sequence to the absurdly anticlimactic final line. In terms of storytelling, the film is clearly a mess. But what a wonderfully rich, elaborate, and fascinating mess it is. To be honest, plot clarity has never held much interest for David Lynch. He's a visual artist, more concerned with evoking moods and atmosphere than exposition. His best films (such as 'Blue Velvet' and 'Mulholland Drive') can be argued to have little narrative logic at all, but work instead based on emotional logic. Scenes connect and stories progress because Lynch makes you feel them bind together, even when the puzzle pieces don't fit together easily. He's a filmmaker obsessed with details and textures, and tells his stories more through their arresting images than their dialogue. The director has never been much concerned with the mechanics of staging an action scene, but he's called upon to wrangle a couple of big ones here. The results feel disappointingly perfunctory; you can tell that Lynch just wants to get them out of the way so that he can skip ahead to the juicier character moments to follow. As you can imagine, this creates something of a conflict with the needs of the Hollywood studio system, especially when it comes to adapting an existing literary property with a huge fan base. Like the best adaptations, Lynch's film attempts to be more than just an illustrated version of the novel. The director brings plenty of his own sensibilities to the production. This is unmistakably a David Lynch film through and through. 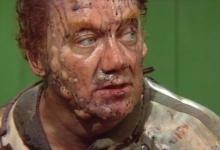 It's the little touches, like the Baron Harkonnen's repugnant facial sores, Beast Rabban ripping the tongue out of a cow carcass to munch on, or the cat with a mouse sutured to its back, that are pure David Lynch and some of the most memorable images in the movie. For visual imagination alone, 'Dune' is wondrous to behold. Although the Frank Herbert novel was intricately detailed in story and character, the text was curiously lacking in visual descriptions. This allowed Lynch to step in and art-direct the hell out of the picture. The story spans four different planets, each with its own unique culture and history. As depicted here, each has been given an ornate and distinctive production design. The detailed sets and costumes borrow elements that span the centuries from classical Venetian architecture to contemporary industrial wastelands, fused together into a rich tapestry that imagines the future without looking gimmicky or "futuristic." The designs so perfectly fit the story that it's almost impossible to re-read the Herbert novel without picturing the Lynch film in your head. 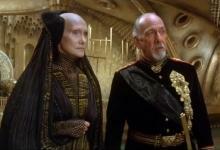 In discussing it, Frank Herbert himself said, "As far as I'm concerned, the film is a visual feast. I would love to have some of the scenes, as stills, to frame and have around me." Unfortunately, some of the dated blue screen visual effects haven't aged well, and frankly some weren't very good even by 1984 standards. However, the models and miniatures tend to hold up, as do the lovely matte paintings. The use of foreground miniatures to add depth and scope to wide shots is still impressively seamless in many scenes. Fresh off his 'E.T.' success, Carlo Rambaldi was brought in for creature effects; the Guild Navigator he built per Lynch's design – a sort of giant wrinkled brain that floats in a tank of orange gas, with deformed dwarf appendages, bulging eyes, and a suspiciously vaginal mouth – is one of the most freakily surreal monsters ever put to celluloid. Even at their least photorealistic, the images Lynch was attempting to create with the special effects are always intriguing. Force fields surround the Atreides soldiers in a series of connected blocky cubes that refract light in curious ways, rather than the expected glowing bubbles. The Spacing Guild heighlighners, massive cylindrical transport ships, "fold space" by miraculously appearing in orbit around a planet, silently and with little visible disturbance. Even the controversial Weirding Modules, the gun weapons that Lynch substituted for the hand-to-hand combat in the novel, fire not the typical laser beams but sound energy blasts that cause a target's molecules to vibrate explosively. (This effect is the least consistently or convincingly applied in the movie, sadly). And of course there are the sandworms of planet Arrakis, gigantic beasts that crush and devour all around them, brought to life via animatronic devices that usually look good in individual shots but somehow never quite integrate properly with the rest of the live-action footage. Despite some technical limitations, the intent of Lynch's imagery and the breathtakingly gorgeous photography by Freddie Francis make for a truly unique vision unlike any other science fiction movie before or since. It's a production of extraordinary scope and ambition, one of the few in the genre beyond '2001' or 'Blade Runner' to have genuine intellectual ideas on its mind. Lynch's 'Dune' is more art film than sci-fi action blockbuster, a fact that has only caused misunderstanding and disappointment for most viewers who've watched it under different expectations. General moviegoers wanted an action-packed 'Star Wars' clone, Frank Herbert fans wanted a word-for-word perfect illustration of the novel, and David Lynch fans wanted something completely off the wall with no concessions for mainstream acceptance or popularity. 'Dune' is not quite any of those things. It's a cinematic conundrum, and I find it absolutely beautiful and transfixing. David Lynch had a terrible experience making 'Dune', one that changed his entire outlook on the filmmaking process. Since that time, he has divorced himself completely from the movie, considering it the studio's property to do with as they please without his further participation. He's also turned down directing assignments that he hasn't developed himself, and has insisted on the right of final cut in all of his subsequent contracts. Coming out from under 'Dune' inspired him to hone and perfect his next project, 'Blue Velvet', which would become his masterwork. If not for 'Dune', we wouldn't have 'Blue Velvet', or 'Twin Peaks', or 'Mulholland Drive' as we know them. Commercial failure or not, 'Dune' was an important step in the development of a filmmaking artist. I love 'Dune'. I adore 'Dune'. I consider 'Dune' nothing less than a flawed, misunderstood masterpiece of the science fiction genre, one that's faced an unfair fight for recognition and respectability ever since its debut. 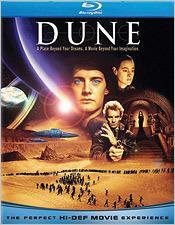 Universal Studios Home Entertainment released 'Dune' on HD DVD back in late 2006. It's taken a while, but the studio has finally gotten around to issuing a Blu-ray now as well. The movie was also previously released on Blu-ray in France and Germany by different studios. Universal's Blu-ray is, for the most part, a direct port of the earlier HD DVD. The disc contains only the 137-minute theatrical cut, which is David Lynch's one and only director's cut. It does not contain the longer Extended Edition re-edit that was originally created for TV broadcast without Lynch's participation or approval. Universal released that longer cut on DVD in early 2006. The Blu-ray doesn't even contain any of the footage from that version of the movie as a supplement. Perhaps it's being saved for a Special Edition re-release down the line? The case art likewise uses the same Photoshop montage last seen on the DVD and HD DVD. I have mixed feelings about that. It's a little cheesy, but not far removed from the spirit of some of the original theatrical posters. It's grown on me since the DVD was first released. The disc has no promos or trailers forced before the main menu. However, the menu (which is designed in Universal's standard generic template) plays in a very annoying short loop. The disc also defaults to displaying a news feed of studio PR announcements and ads over the menu via the BD-Live connection. You have to manually disable that every time you load the disc. All right, listen. I know 'Dune' inside and out. Really. I'm not trying to be arrogant about this, but I lost count long ago of how many times I've seen the movie. At current count, I own 29 unique copies of the film across 10 video formats. Chances are, you've probably never heard of VHD, a short-lived videodisc format released in Japan during the mid-1980s. Rest assured, I own a copy of 'Dune' on it. I also saw the movie in 35mm a few years ago when it played for one-day-only at a local repertory theater. Despite my familiarity with it, I watched the movie in full again for this review. I also directly compared the disc against the HD DVD, the French Blu-ray, and the German Blu-ray. I reviewed the HD DVD when I was with DVDTalk. The 1080p/VC-1 transfer on Universal's new Blu-ray is, as far as I can tell, a direct port of that disc's video. In transferring some of its other HD DVD titles to Blu-ray, the studio has been known to re-encode the video compression. I can't confirm whether that happened here. Both discs use the VC-1 codec. I didn't check bit rates, because they're meaningless and I have no interest in such things. I did my best to compare the discs back-to-back. What I can say is that by the time I ejected one, put in the other, and cued up the same scene, my human short-term memory was incapable of distinguishing any significant difference between them. I'm sure that screen-shot lovers will have a field day toggling back and forth between individual still frames on their computers to find every errant pixel. Have a blast with that. Realistically, for all intents and purposes, these two discs look identical during actual playback. I'm fine with that. Of all the copies of 'Dune' I own, the HD DVD and now this Blu-ray are the standard bearers. The 2.35:1 image is very sharp and has an outstanding sense of detail and depth. In fact, during some scenes, the high-def picture here is as good as anything I've ever seen on Blu-ray. Skin pores, thread patterns, and wood textures are remarkably resolved. Look closely during the prologue, and you can see a very faint scar on Virginia Madsen's forehead beneath the makeup. Colors in some scenes look a little subdued, especially the Emperor's throne room. However, overall, they are the cleanest and most accurate found on any video edition. Plenty of scenes have a real vibrant pop. There are no Edge Enhancement, contrast boosting, or Digital Noise Reduction artifacts in evidence. (Anyone who claims that this disc has been DNR'ed is flat-out ignorant. That really needs to be said.) 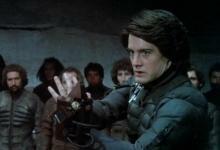 For a movie from 1984 with a lot of optical effects, 'Dune' has never been particularly grainy. This was a big-budget production at the time, with an Oscar-winning cinematographer behind the camera. The photography is extremely well-lit, and much of it was shot under the bright desert sun. Special effects were shot on 65mm stock to maintain quality and consistency with the 35mm footage after the optical composites. Yes, some scenes in the movie are grainy, especially some effects shots and night scenes. But the grain has been well digitized and compressed. It looks natural and film-like. The only disappointments here are some light speckling and minor damage on the film elements. The speckles first start during the prologue narration. For an example of the damage, see the dirt along the left edge of the frame at the 54-minute mark. Neither problem is severe, and never enough to take you out of the movie. But they recur pretty much throughout. You learn to tune them out after a while. The problems are really no worse than watching a typical 35mm film print at a theater. Still, it would have been nice if Universal had taken the time to digitally repair such issues. In comparison, the foreign Blu-rays both look very good as well. They have their own strengths and weaknesses. The French disc has almost no dirt or film damage, which is a big credit in its favor. However, the picture on that disc is a bit too bright, and looks washed out during dark scenes. This exposes the matte lines around spaceships. Colors are also oversaturated. Flesh tones have a sickly yellow tinge. The German disc comes from the same basic transfer as the French copy, but has been tweaked electronically to bring down the brightness and contrast. While this means that it no longer looks washed out, black levels and shadow details are visibly crushed in most dark scenes. All of these high-def discs are visually pleasing in their own ways. Nevertheless, despite its relatively minor issues, Universal's Blu-ray can be considered at present the reference standard for 'Dune'. And that's coming from someone who knows. For the Blu-ray, Universal has upgraded the soundtrack to lossless DTS-HD Master Audio 5.1 format. The previous HD DVD had a high-bit-rate but lossy Dolby Digital Plus track. I have no interest in dredging up old format war arguments. Generally speaking, DD+ at the 1.5 Mb/s rate is considered audibly transparent to the original studio master in double-blind listening tests, despite not being technically lossless. When I reviewed the HD DVD, I gave it a 3.5 star score for audio. I'm bumping that up to 4 stars here. I debated this, and honestly could be persuaded to go either way. The change has little to do with the formats used. In fact, in my comparisons, I didn't note anything that stood out to me as different between the two discs, other than the default volume level. The Blu-ray's DTS-HD MA track has been jacked up about 10 dB. No joke, it's freaking loud. When I started the disc at the normal volume settings on my receiver, Princess Irulan was shouting at me in her prologue. "A BEGINNING IS A VERY DELICATE TIME!!" Ouch. After volume matching, the Blu-ray and HD DVD are virtually indistinguishable. My higher rating for this disc is reflective of the fact that, after watching it again, I was left a little more impressed with the soundtrack this time. Where both high-def discs shine is in the clarity and fidelity of the most subtle auditory details. 'Dune' has a truly fascinating sound design. (It was actually nominated for a Best Sound Academy Award, despite the fact that everybody hated the movie.) Listen to the Guild Navigator's complex mechanical breathing/pumping noises. Listen to the faint sound of crashing waves heard through the Caladan palace walls. Listen to the echo of a far-off wind howling through the Fremen caves. Remarkable care and attention was paid to this sound mix, and that work is clearer here than any previous video formats (and even most 35mm theatrical prints) could ever capture. As much as audiences disliked Lynch's use of hushed whispers for thought voiceovers, every one is perfectly intelligible, down to minute nuances in inflection. The track also has some surprising dynamic range. There are few slam-bang-boom action scenes in the movie, but the attack on the Arakeen palace is a highlight with plenty of shooting and explosions. The first blast of Paul's Weirding Module early in the movie delivers a nice kick. Many other scenes have an intense pulsing bass. The Thumpers really will thump your subwoofer. All that low-end activity is crisp and refined, never boomy. The soundtrack does still have some age-related limitations, though. The Toto score is a bit thin and strident, especially the opening theme. The high end is sometimes brittle. Surround usage is restrained for a sci-fi movie, mainly reserved for ambience and rare directional effects. This isn't a whiz-bang rollercoaster type of soundtrack. If imperfect, the Blu-ray is a fine representation of the way 'Dune' should sound. The Blu-ray carries over most of bonus features from the HD DVD. All of these first appeared on the Extended Edition DVD. Deleted Scenes (SD, 17 min.) – The disc has 11 deleted scenes in rough workprint condition, plus a video introduction. In the intro, producer Raffaella De Laurentiis attempts to debunk the myth of the alleged "4-hour rough cut" once and for all. None of this deleted footage appears in the extended TV cut or any other version of the movie. This is all truly unused material. Designing Dune (SD, 9 min.) – Many craftsmen who worked on the film discuss the picture's elaborate art design with some pride . Concept drawings and detailed photos of props are also shown. Dune FX (SD, 6 min.) – Priceless behind-the-scenes footage of explosions, wire work, and the fighting robot in operation. Dune Models & Miniatures (SD, 7 min.) – Discussed here are the foreground miniatures used in wide shots, motion control, and of course the worms. Dune Wardrobe Design (SD, 5 min.) – The movie's costume designers reveal that the Guild uniforms were made from bodybags! Also mentioned are the stillsuits and a number of designs that were produced but never used. I neither expect nor need a lot of agreement with my review of 'Dune'. I realize that the movie is widely disliked and disparaged, even by its own director. I don't care. 'Dune' is a great movie no matter what the naysayers complain. I love and respect it more each time I watch it. This is my review, and people will just have to deal with that. The Blu-ray release looks terrific. Although imperfect, it's the current reference standard for this movie. And I feel that I'm in a position to state that with some authority. The bonus features are sparse, but those deleted scenes are priceless. Fans of the movie need to own this disc. No question.